Making any style your own requires knowing a little bit about what does—and does not—define it. Whether you’re looking to completely remodel your kitchen or simply update it with a few touches, there’s no shortage of inspiration out there, though finding the right place to start for your specific kitchen can be a bit daunting. 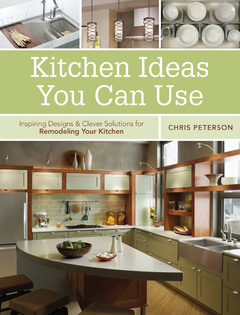 Luckily, author Chris Peterson has written Kitchen Ideas You Can Use, a new book about how we can highlight our kitchen’s design and function in beautiful, on-trend, and comfortable ways. Here he shares insights about the warm, casual style of the country farmhouse kitchen. The country, farmhouse, and cottage kitchen style is set apart by the use of simple, repetitive elements such as beadboard or faux beadboard cabinets and wall cladding. Homey, rough-hewn materials come into play, such as tin backsplashes and ceilings and butcher block countertops. Farmhouse is a slightly more rustic variation, featuring certain key indicators like the apron-front “farmhouse” sink. The kitchen: command center of the home, headquarters for all things edible, family-member traffic funnel. Whether you’re a bachelor or bachelorette in a small starter home or part of a larger family, if this isn’t the most-used room in your house, you must not be home very often. In the kitchen, functionality and aesthetics go hand-in-hand; the mood is just as important as the machinery, and if you’re looking to capitalize on the space in your home – no matter how big or small – you’re going to need a few pointers. Fortunately, in Kitchen Ideas You Can Use, our home Do-It-Yourself expert Chris Peterson gives you a chapter-by-chapter breakdown of all the kitchen essentials: cabinets, countertops, appliances, flooring, wall treatments, storage, islands, eat-in areas, lighting, and ventilation. Kitchen remodeling is normally the most expensive home improvement project. But with over 300 inspiring photographs, Peterson’s straightforward insights, and our attention to the latest trends from professional designers, you can skip the cost of hiring a professional and craft your own kitchen–your own way. From choosing between traditional and induction cooktops to drawing up the most efficient layout scheme and landing on that perfect backsplash, Kitchen Ideas You Can Use might finally be the one thing in your house more useful than the microwave. Chris Peterson is a professional writer and editor based in the pretty little town of Ashland, Oregon. An expert in home design, repair and renovation and an avid cook, he’s the author of: Manskills; When Duct Tape Just Isn’t Enough: Quick Fixes for Everyday Disasters; A Man’s Whirled: Every Guy’s Guide to Cooking with the Blender; and several other books. Want to Join the Draw Wildlife! Commotion?